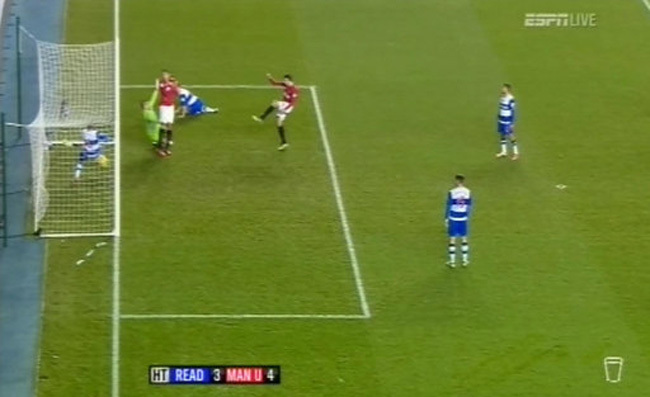 If this goal had been given, that would have made it eight in the first half at the Madejski, as Reading and Man Utd, through hideous defending, conspired to give the watching fans a 45-minute goalfest. Anyway, the officials missed it. Cue video technology debate shenanigans. OMG ABOUT TIME A DECISION WENT AGAINST UTD SCUM LOL TWATS. 1. Your Caps Lock is on. Turn it off. 2. You might want to consider taking lessons in English, specifically the construction of sentences. 3. You’re 11th. We’re 1st. If you see how much all the other teams are struggling I think it’s really not gonna be that hard for United to win this year. Arsenal and Liverpool have been out of the title for quite a while now, Chelsea are looking very bad and I think Benitez will haul them down possibly out of the top 4 and City are looking like a shadow of the team they were last year. They always seem to need a penalty to eqaulize or the super sub Dzeko, and their rate of play has really slowed down. As for the surprise high flyers like West Brom, it’s really unlikely that they can sustain that form for long enough to make a title run.